The Maine Republican, whose website and phone system buckled under the load of constituent contacts, tweeted that she backed the 'sensible agreement' shortly after a meeting with several sexual assault victims in her office. Sen. Susan Collins of Maine said late Friday afternoon that she supports a plan for a weeklong delay for a Senate confirmation vote on Supreme Court nominee Brett Kavanaugh. Collins has not said how she will vote on the nomination, but sent out a tweet indicating her support for the delay after pressure increased during the day over whether she will vote to confirm Kavanaugh. Her statement came after several other senators who were seen as potential opponents of the nomination already had voiced support for a delay. Collins spoke with Republican Sen. Jeff Flake of Arizona before he announced the plan to move Kavanaugh’s nomination forward from the Senate Judiciary Committee to the full Senate, and then delay the confirmation vote for a week to allow the FBI to reopen its background investigation of Kavanaugh, said Annie Clark, Collins’ spokeswoman. Kavanaugh has been accused of sexually assaulting a teenager when he and the girl were private school students in suburban Maryland early in the 1980s. Collins also met Friday afternoon with Flake, Sen. Lindsey Graham, R-S.C., and Sen. Lisa Murkowski, R-Alaska, in the office of Senate Majority Leader Mitch McConnell to iron out details of the plan, Clark said. After that meeting, the Judiciary Committee formally requested that President Trump ask the FBI to look into the allegations against Kavanaugh. Earlier in the day, Collins met in her office with several Maine women who were survivors of sexual assaults. Trump announced later Friday that he had ordered the FBI to conduct the probe. The reopened background investigation would look into allegations that Kavanaugh sexually assaulted a 15-year-old girl while he was in high school. Kavanaugh and the alleged victim, Christine Blasey Ford, both testified before the Senate Judiciary Committee on Thursday. The committee voted Friday to advance the Kavanaugh nomination to the full Senate, but Flake said he would seek the delay to reopen the investigation into the allegations. According to Ford, Judge was in the room when Kavanaugh allegedly assaulted her. Judge, a friend of Kavanaugh’s, has said through letters from his lawyer that he doesn’t remember the incident. 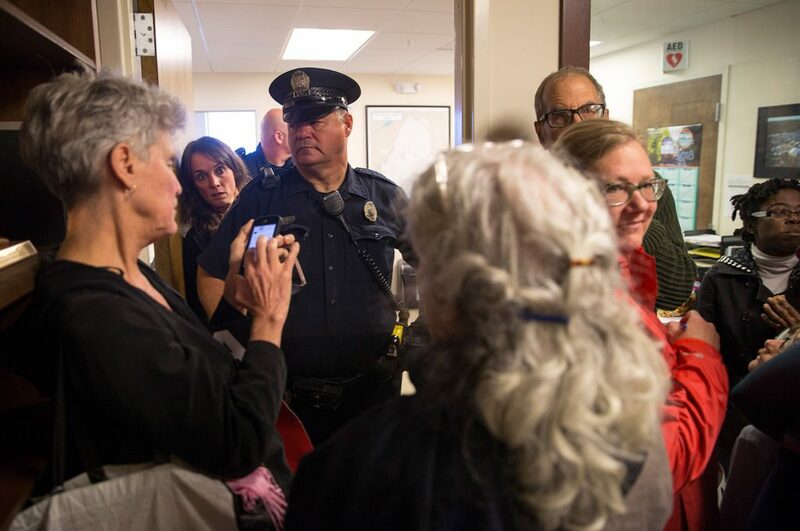 Mainers trying to weigh in on the matter by calling Collins’ state offices or by reaching her via her U.S. Senate website were frustrated late Thursday and early Friday by busy signals and a broken link on Collins’ contact page online. The site was operational again by midmorning. Collins was attending meetings at her offices in the Dirksen Senate Office Building on Friday, including the session at noon with five sexual assault survivors from Maine. Catherine Perreault of Portland was among the women who met with Collins. 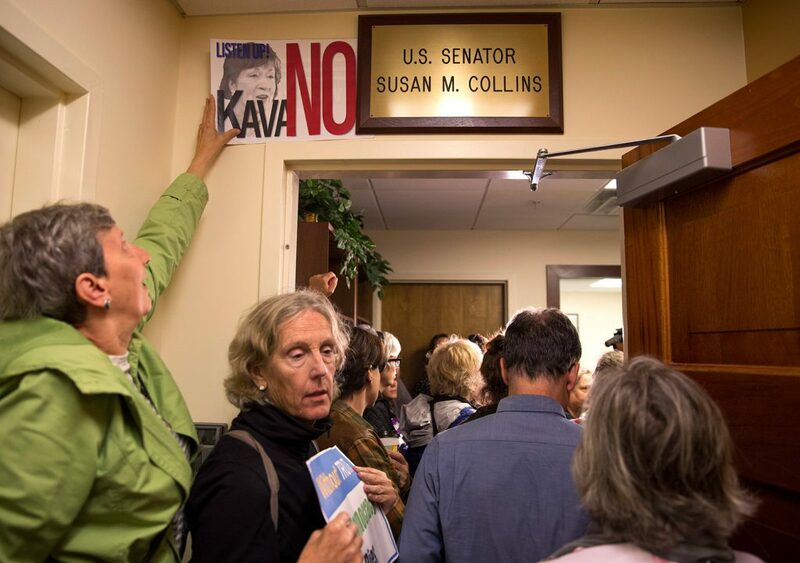 Originally from Madawaska, Perreault said Collins was engaged and listening closely to the contingent of Maine women, although she gave no indication of how she might vote on Kavanaugh. In all, Perreault said, there were between 20 to 25 women from Maine who traveled to Washington to talk with senators or their staff members about Kavanaugh. Perreault, who said she was a victim of harassment and minor assault, said she and the others were impressed Collins made time to meet with them and were hopeful she would vote against confirming Kavanaugh. “I came to D.C. to represent every friend I have who was never believed, who is not strong enough to speak out themselves,” Perreault said. 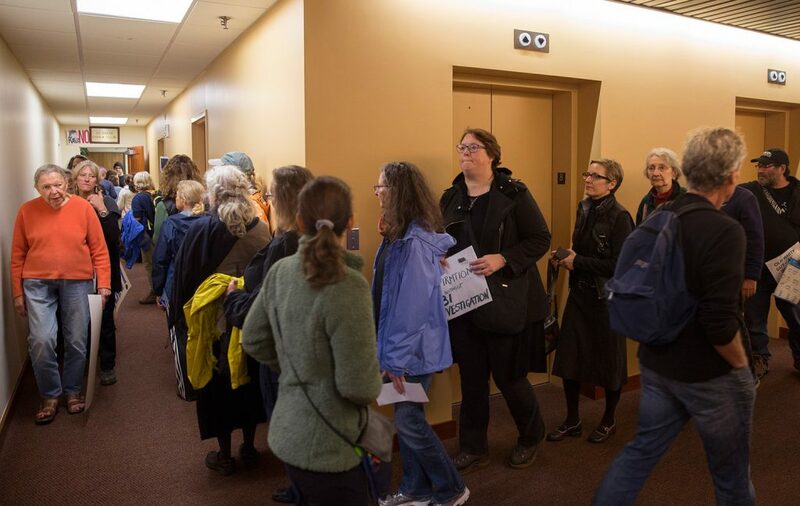 In Portland, dozens of protesters flocked to Collins’ offices at midday and tried to stage a sit-in as they met with staff and urged Collins to oppose Kavanaugh’s nomination. Police were called and later tweeted that two protesters were removed and issued criminal trespass summonses and released. 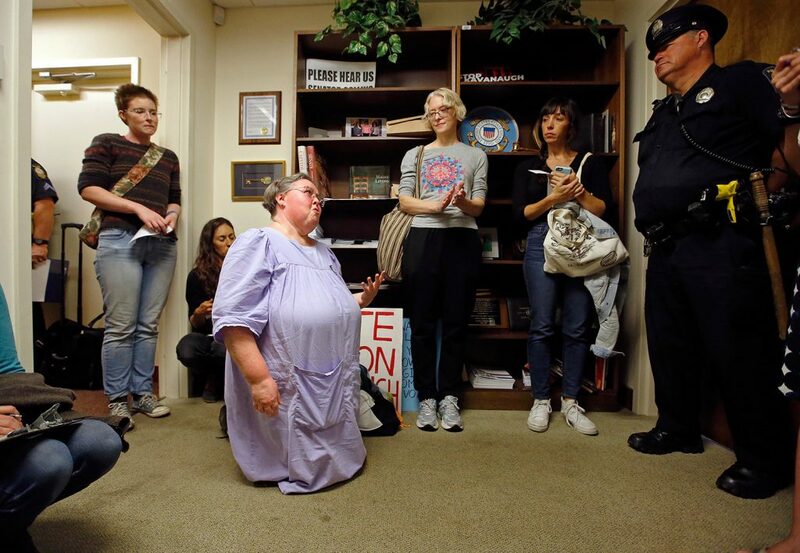 About 40 protesters also gathered at her office in the Edmund S. Muskie Federal Building on Sewall Street in Augusta to voice their concern about or support for Kavanaugh. Mark Winter, Collins’ Augusta office representative, said he met with constituents two at a time. “When I get a group of people who come in and we’re not ready, I want to give everybody a fair opportunity … to have a conversation with a staffer a few at a time,” Winter said. He declined to comment on the split of the views of people he met with, but said he heard from people supporting Kavanaugh’s confirmation. He expects some frenzied days leading up to the vote and immediately after it. “Until the vote on the floor happens, it’s going to be busy, busy, busy,” he said. It appeared that Collins, along with a handful of other senators, had been assigned Capitol Police security details. Collins was seen leaving her offices Friday in a police car, according to photos on Twitter. A moderate Republican, Collins is one of a few key holdouts in a pending vote on Kavanaugh, after Flake, R-Arizona, announced Friday that he would vote to confirm Kavanaugh. Collins, 65, is two-thirds of the way through her fourth consecutive six-year term in the Senate and would be up for reelection in 2020. Both Collins and Murkowski have not said how they will vote as Kavanaugh and Ford presented conflicting statements before the Senate Judiciary Committee on Thursday in an unusual continuation of Kavanaugh’s confirmation hearing. 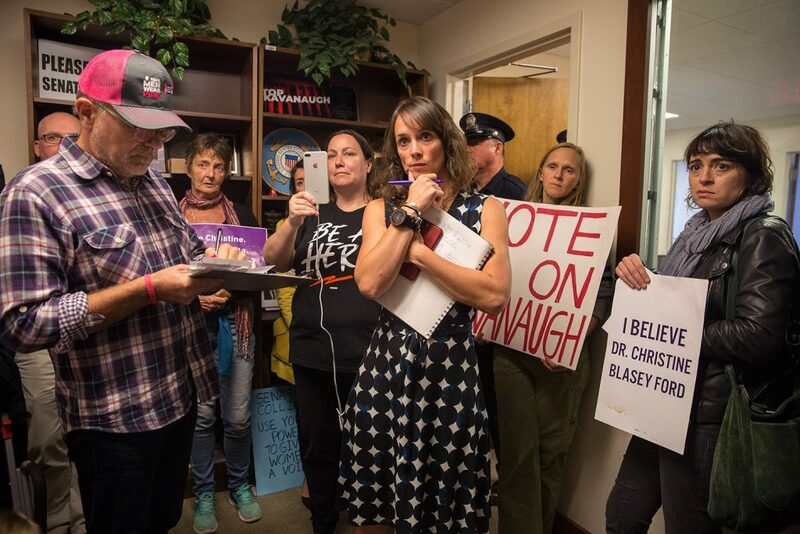 But later Flake – after being confronted by two women who identified themselves as sexual assault survivors and who were organized by the same group as the women from Maine – called for a one-week delay and an FBI investigation into the allegations by Ford before any final confirmation vote in the Senate. Flake also agreed to sign on to a letter to Trump urging him to order an FBI investigation into the allegation that Kavanaugh assaulted Ford, placed his hand over her mouth and tried to remove her clothing during a party in Maryland in 1982. 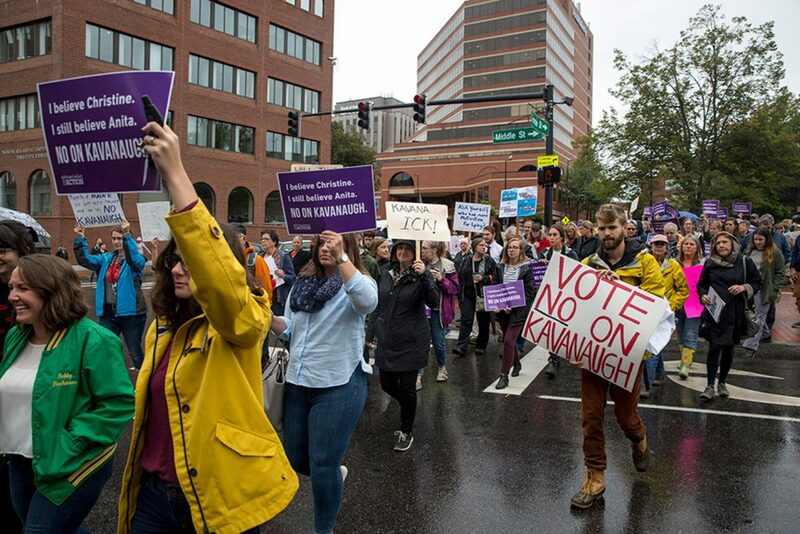 In a Senate narrowly controlled by Republicans, 51-49 – together Collins and Murkowski could block Kavanaugh’s confirmation, although Collins has never voted against any nominee to the U.S. Supreme Court, voting to approve appointees by both Republican and Democratic presidents. Also Friday, Sen. Joe Donnelly, D-Indiana, said he would vote against Kavanaugh’s appointment. Donnelly is among only three Senate Democrats who voted to confirm Trump appointee Justice Neil Gorsuch. Press Herald Staff Writer Edward D. Murphy and Kennebec Journal Staff Writer Sam Shepherd contributed to this report.